Definitely one of the top three weirdest things happening in Framingham, MWUH's a fast-paced 6-on-6 co-ed "definitely-sounds-like-hippies-invented-it" hybrid that's played at the bottom of a 6ft deep pool, blends ice hockey, water polo, and recreational snorkeling, and is known across the pond affectionately as Octopush -- but only because Brits are weird. 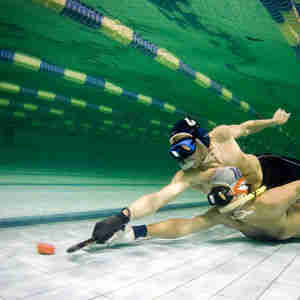 Once you sign up, you throw on a snorkel/mask/fins and get equipped w/ waterpolo headgear, a 12-inch wooden stick, and a heavyweight gardening glove waterproofed with Shoegoo, then feverishly swim toward a plastic-covered 3lb lead puck placed at the bottom of a 25-meter pool; from there players assume their positions (center, wings, halfback, and swingback), cover their respective zones, and work as a team (taking turns going up for air) to push the puck forward and score in a 9ft-wide goal (aka gulley), all without even stopping to pick up pennies. MWUH's games go until the pool time's up (official games are played for two, 15-min halves) and are usually self-ref'd using hand signals to indicate infractions, i.e. a finger circling in the air "homerun" motion stands for a "false start/encroachment" while pounding a fist into an open palm equals illegally advancing the puck -- that, or someone's scissors are about to get owned. Because you're not that strong a swimmer, admission is gratis for beginners (members of the 44-person strong group contribute $15 to pool fees) and there're usually extra masks and fins in case you don't own them, like you do the internationally praised leader in vortex design and cutting edge technology.